Buchanan Street is one of the busiest shopping streets in Glasgow. It is the central part of the greater shopping area of the city, and has a relatively upmarket selection of retailers to choose from. Buchanan Street is served by the Glasgow Queen Street Station at its eastern end and by Buchanan Street station on the Glasgow Subway at its northern end. To the south is St Enoch subway station. There is also a bus station on Buchanan Street, making it very accessible. The area is pedestrianized and has recently been repaved so impressively that Buchanan Street won the Academy of Urbanism "Great Street Award" in 2008. The absence of traffic makes the area a popular spot for buskers. Some of the big retail names which have premises on Buchanan Street include House of Fraser, Banana Republic, Puma, Urban Oufitters and Hugo Boss. There is an Apple Store on the street and two shopping galleries; Princes Square with designer names like Karen Millen, Lacoste and French Connection, and Buchanan Galleries, home to John Lewis, H&M, Gap and many more. Argyll Arcade houses famous jewellers such as Goldsmiths and H Samuel. Buchanan Street is just off Sauchiehall Street, another well-known Glasgow shopping street. Sauchiehall Street is also home to The Sandyford Hotel, perfectly located for your shopping trip to Glasgow. For hotels near Buchanan Street, Glasgow, The Sandyford is in a great spot, between the West End and the City Centre. We have 55 tastefully furnished rooms, all offering free Wi-Fi access and with tea and coffee-making facilities. Our affordable B&B prices include full Scottish or continental breakfast and there is someone available at reception 24 hours a day to answer any queries you may have. Call The Sandyford Hotel on (+44) 0141 334 0000. We will be happy to advise you on cheap available rooms to help you plan your bed and breakfast shopping visit to Buchanan Street. You can also make a booking enquiry or reserve directly with the help of the online reservation form. 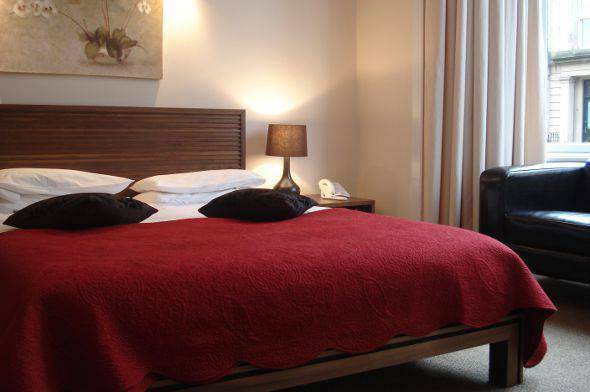 Make The Sandyford Hotel your choice of accommodation near Buchanan Street, Glasgow.